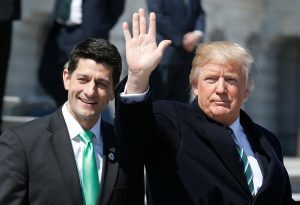 WASHINGTON — President Donald Trump agreed to add fresh Medicaid curbs to the House Republican health care bill Friday, bolstering the measure with support from some conservative lawmakers but leaving its prospects wobbly. House leaders discussed other amendments calibrated to round up votes and scheduled a showdown vote for Thursday. While the rapid-fire events seemed to build momentum for the pivotal GOP legislation, its fate remained clouded. One leading House conservative said the alterations were insufficient and claimed enough allies to sink the measure, and support among GOP moderates remained uncertain. Across the Capitol, Sen. Dean Heller, R-Nev., who faces re-election next year, became the fourth Republican senator to announce his opposition. That left Senate GOP leaders at least two votes shy of what they’d need to prevail. The Republican bill would kill much of former President Barack Obama’s health care law, including tax penalties for people who don’t buy insurance and its expansion of Medicaid, the federal-state health program for the poor. It would create new tax credits that would be less generous than current federal subsidies for many consumers, and repeal levies on the wealthy and medical firms that helped finance Obama’s expansion of coverage to 20 million Americans. The deal between Trump and lawmakers would let states choose to impose work requirements on some of Medicaid’s roughly 60 million recipients. Details were initially unclear, but Republicans have recently discussed using them for healthy people with no dependents. The agreement would also allow states to decide to accept a lump-sum federal payment for Medicaid, instead of an amount that would grow with the number of beneficiaries. The program currently costs the federal government around $370 billion annually and automatically covers costs, no matter the amounts. “These changes definitely strengthen our numbers,” said the House GOP’s top vote counter, Rep. Steve Scalise of Louisiana, among those who met Friday with Trump. “But they also show that President Trump is all-in now,” a help in winning converts. Among those accepting the agreement was Rep. Mark Walker, R-N.C., leader of the Republican Study Committee, a large group of House conservatives. “We’re a yes. We’re excited to be there,” he said at the White House. It seemed clear that GOP leaders remained short of the 216 votes they’ll need, and additional changes were in the works. Rep. Tom McClintock, R-Calif., said he’d been assured by House Speaker Paul Ryan, R-Wis., that the bill’s tax credit would be adjusted to focus more benefits on lower-income people. Rep. Robert Aderholt, R-Ala., among those who met with Trump, said the president “told his people” to work on changes making the measure more generous for lower-earning and older Americans. “Everything has to be a change that would increase the vote count,” Scalise said. Conservatives seemed likely to not achieve their demands that the GOP bill’s phase-out of Obama’s Medicaid expansion — now 2020 — be accelerated to next year and that the tax credit not go to people with little or no tax liability. Centrist Republicans remained wary of a bill they fear will yank many constituents from coverage. Many of them are from states where voters have gained Medicaid and other health insurance under the 2010 statute. “We’ll see what changes they’re going to make. I’m listening,” said Rep. Charlie Dent, R-Pa.
Heller joined three other GOP senators in opposing the bill: Susan Collins of Maine, Rand Paul of Kentucky and Mike Lee of Utah. Republican Sens. Tom Cotton of Arkansas and Ted Cruz of Texas have voiced strong objections, and moderates in the Senate are wary of booting constituents off coverage. Republicans have only a 52-48 Senate majority. AP reporters Erica Werner, Kevin Freking, Matthew Daly, Jill Colvin and Kenneth Thomas contributed to this report.